If You suspect that I, at present, work a lot with SQL Server Compact Edition (SSCE) databases than You are absolutely right about it. I have developed two larger solutions where SSCE databases are central parts of the respectively solution. In both projects data is exported to SSCE databases and then the data is acquired from these two sources to populate Excel reports with. 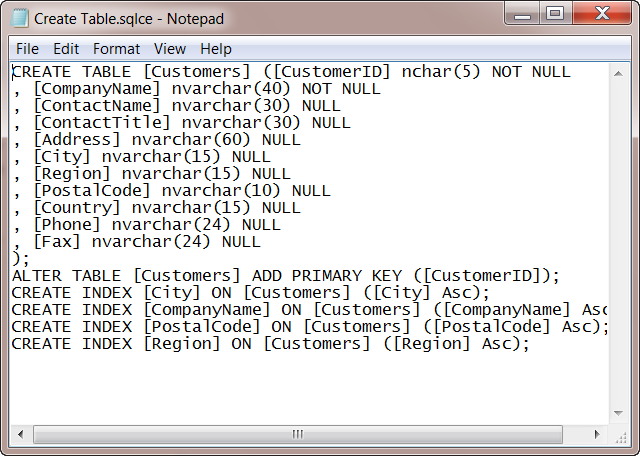 In one of the projects the client also wanted a simple tool to query the database with. I had two alternatives to choose between; build a query tool from scratch or look for a free/commercial query tool that could work with SSCE databases. For several reasons the client wanted in the end me to build a new tool. However, at that time I had already made some investigations and among the few tools I have found CEQuery Tool quickly became a favorite. Create new SSCE databases and tables from scratch. Open existing SSCE databases and acquire data from them. The acquired data can be exported to Excel, i.e. saved to Excel files. Created queries can be saved for later use and are written to Query files. 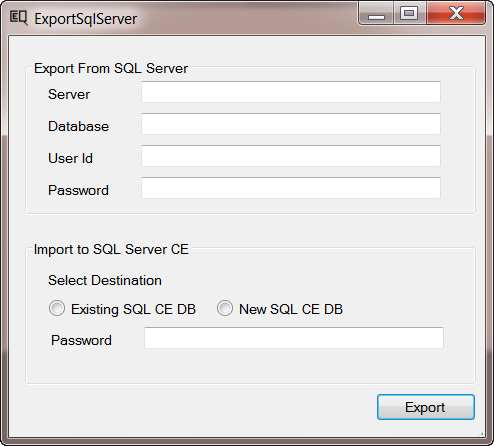 Export data from a SQL Server database, either to an existing SSCE database or to a new SSCE database. The main window for the Export/Import tool is showed below after the list. 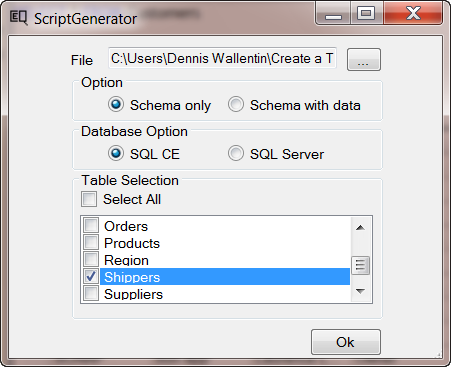 A Script Generator with which we can create scripts, for instance to create or drop tables. These scripts can also be saved for later use and are written to Query files. 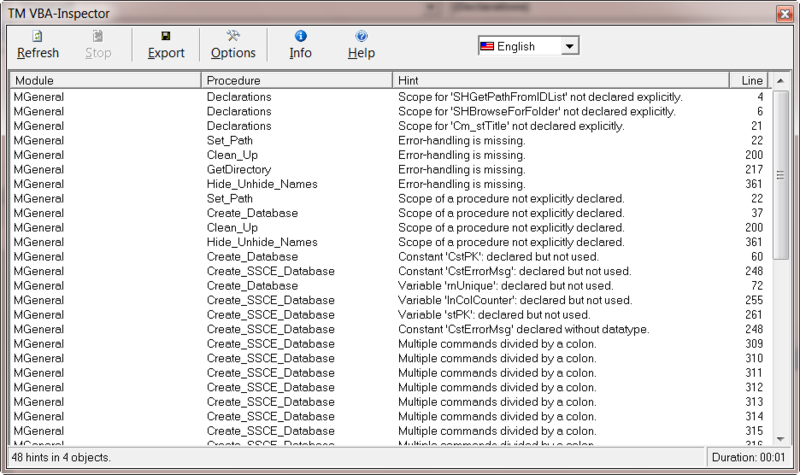 The main window for the Script Generator is also showed below after the list. The CEQuery tool is free and the source code is available which allow us to customize and update the tool, if desirable. For some unknown reasons, at least to me, the Script Generator tool is available via CEQuery’s Command bar and via the right click menu in the Database window but not in the main menu. The Excel Export tool is only available via the right click menu in the Datagrid’s window. Also commands to create and delete tables are only available via the right click menu in the Database’s windows and not via its main menu. The screen shot of the Export/Import tool’s main window. The location of its main tools and commands. Issues with the UI, especially when resizing the windows. The size and the location of the tool’s main windows are not saved between the sessions. The help file is not embedded in the tool. It’s only available as a standalone file. The source code is available so if we find anything annoying or less good implemented we can actually change it. If You work extensively with SSCE databases and are looking for a tool the CEQuery tool should be among the tools that should be evaluated. Recently Thomas Möller (TM) made a blog entry about his free utility, TM VBA Inspector, at Microsoft Access Team’s blog. Since it looked interesting I downloaded it and tested it with Access 2010. I than made a comment at the blog about porting it to other tools in the Office suite, especially to Excel, as I find the add-in to be useful. By double-clicking an entry in the result list You switch directly to the appropriate place in the VBA code. There You can start update the identified error(s) or to improve the present code. Make You selections and next click on the OK button to get back to its main windows. If wanted we can export the output of an evaluation process to a text file by selecting the Export command from its main windows. All in all, the add-in does its job very well and the outcome can also be quite learning. Edit note (10/28/2010): In the latest version a new function has been implemented and that is to exclude modules from being reviewed by the tool if wanted. The tool use the Tool Window Form Border Style which act as the built-in forms do in the VBA IDE. Instead I would see that one of the Fixed Border Styles would have been used. After executing the evaluation process we get a nice list of recommendations in the main windows. It would have been great if we had access to a function that allowed us to easily replace the evaluated code with the recommendations. But I can understand if this will not be implemented as it requires a lot of time to implement it correctly. Anyway, I suggest that You download the tool and test it out Yourself! The last article on the subject will be about how to do it by using LINQ to SQL. 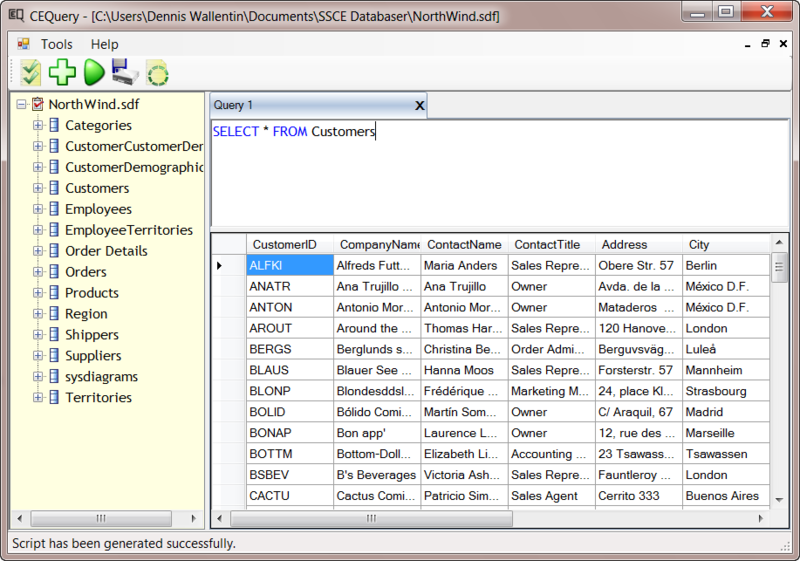 I have already used ADOX in previously blog posts, for instance in the article Create SQL Server Compact Edition Database with VBA. And because the library allows us to work with the framework of databases we can, for instance, retrieve all system tables from an Access database. The first code case below shows exactly how to do it. In the second case I demonstrate how to retrieve all tables from a SQL Server database, including views and system tables. 'x.x above refers to version like 2.8. 'Connection string for an Access 2010 Database. Const Database As String = "NorthWind"
'Open the connection to the database. 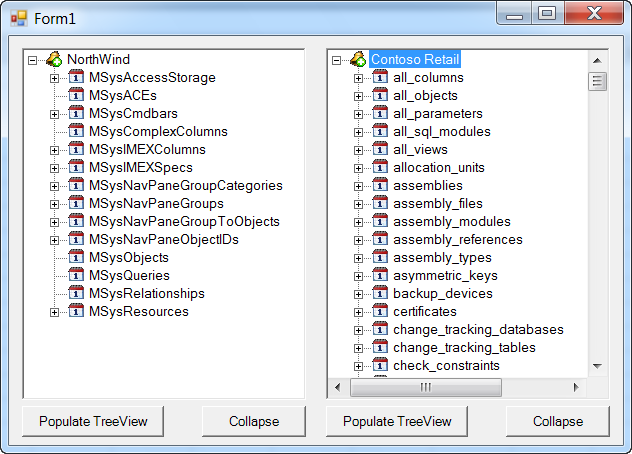 'Populate the TreeView with tables' names and their columns' names. 'To retrieve only system tables. Const Database As String = "Contoso Retail"
The following screen shot shows the two TreeViews after we have populated them with the tables from the two databases. That’s all for now. The next article will finalize the series about creating XLLs with Add-in Express.